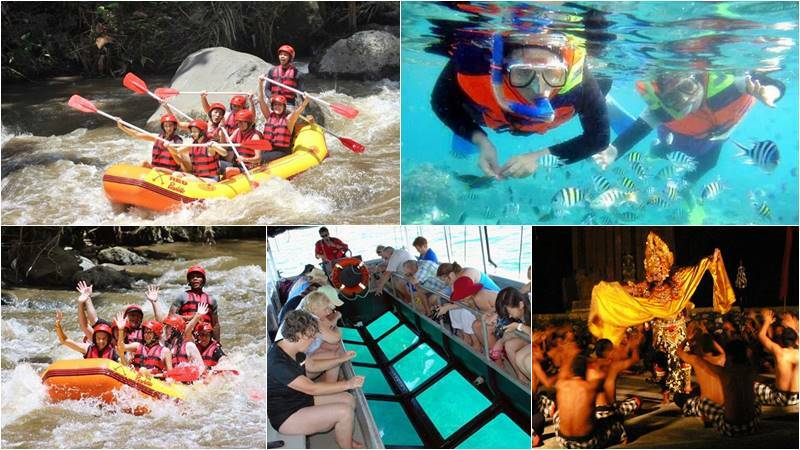 Bali Rafting Package offers a great Bali rafting combination tour with special rate for your Rafting adventure. 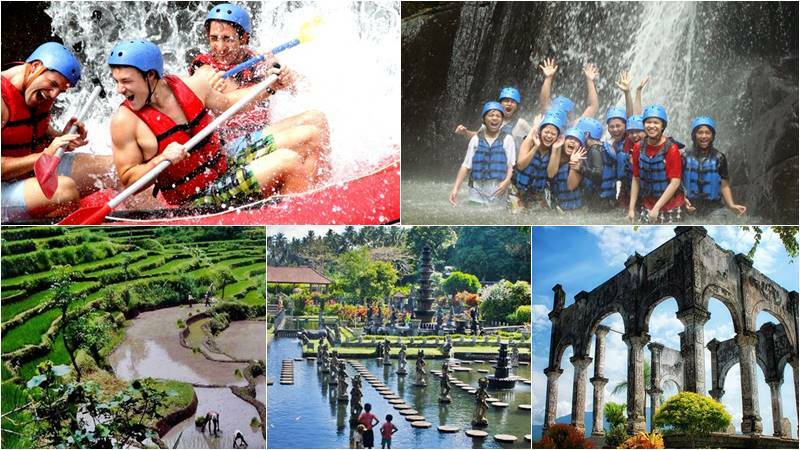 Bali Rafting Package is a Bali Activities or Adventure Tour Packages to enjoy wide range of white water rafting adventure in the paradise island of Bali. Feel the experience of Bali White Water Rafting at the best and most popular river at Telaga Waja River, Ayung River Ubud and Melangit river. Rafting is the most choices adventure in this Bali islands, the activity offer you an amazing experience by accelerate the water rapids challenge from different class and also admire the beauty of Bali Paradise river view with waterfall, cliff carving, forest, bamboo trees and some wild animal like birds, lizards, monkeys. The rafting guide is already experience in the white water rafting tours by offer an excellent service to make you more enjoyable and also know the perfect spot where you can enjoy the most challenging water rapids. Beside that the rafting guide can be your assistant if you would like to take picture with your own camera. 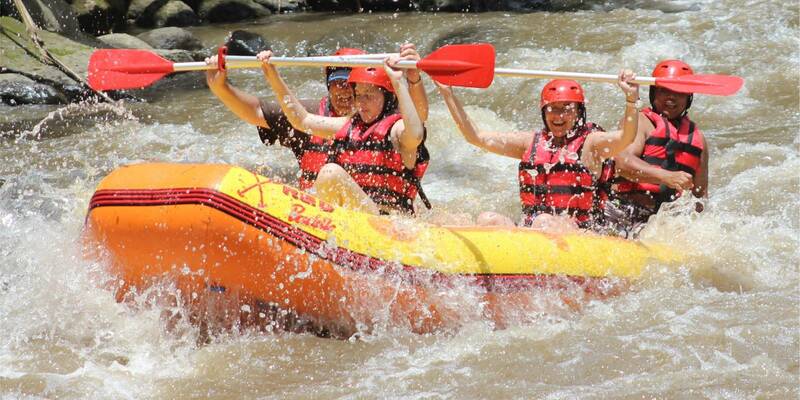 Book now and join with our Bali River Rafting Adventure with the best package offers with special rate. 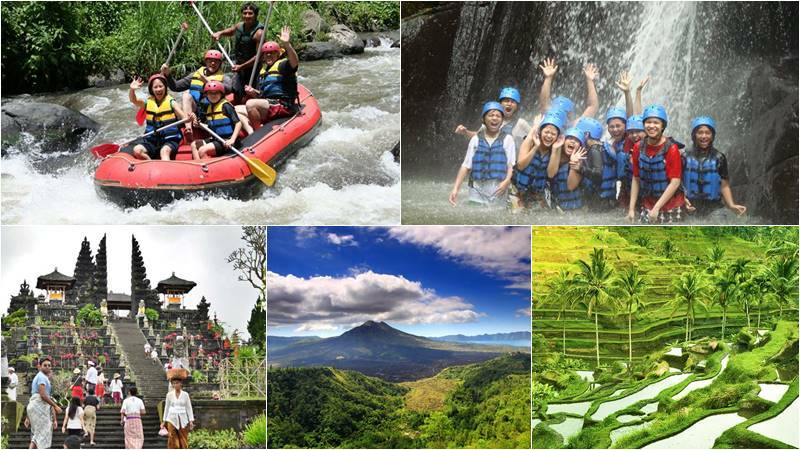 This tour is an incredible package of offers from our Bali rafting with a 30-minute elephant ride. 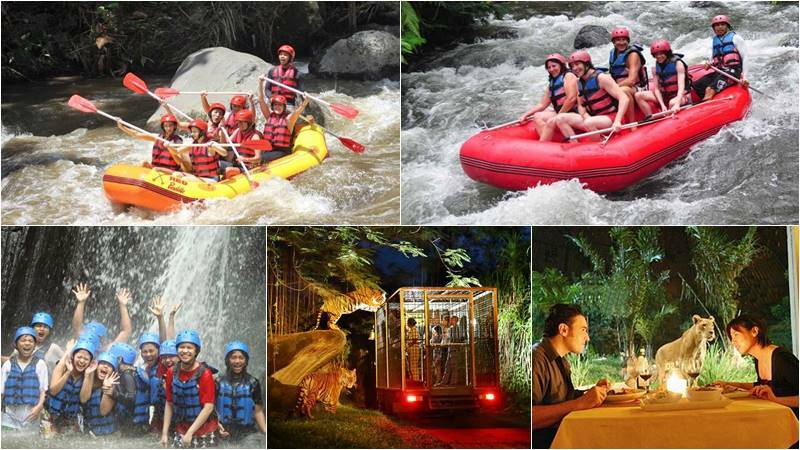 Enjoy the beautiful view of the river Ayung and see the animals as birds and monkeys. A two – hour spa package to recharge your energy ends the tour. 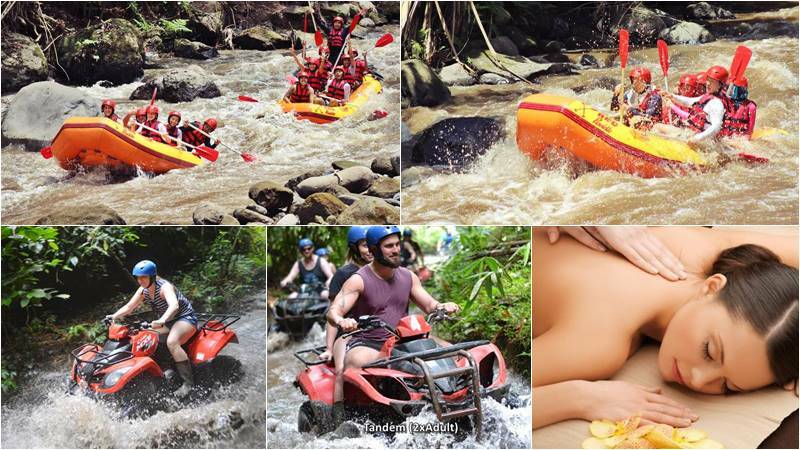 This tour combines Bali whitewater rafting in Ubud with ATV ride through the natural panorama, rice paddy and beautiful village. This tour ends with a spa package of 2 hours for you to recharge your energy after the adventure. 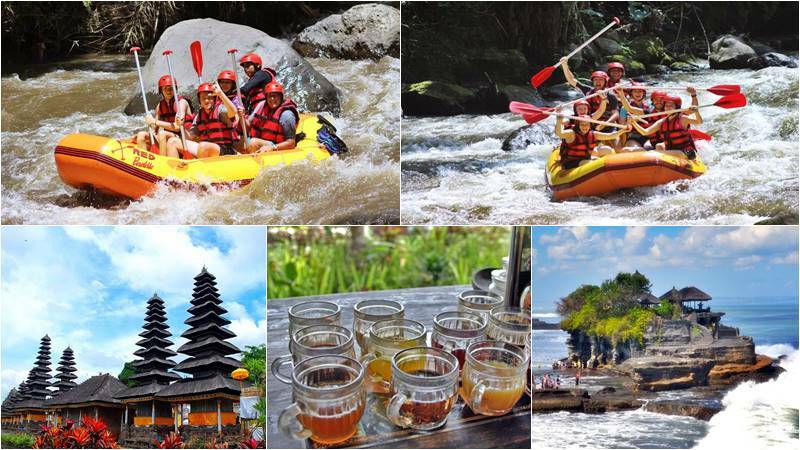 This tour is an interesting package, combining Bali white water rafting with a visit to Bali’s famous Temple; Pura Taman Ayun as one of the most beautiful Bali Temple and Tanah Lot temple to have a chance to have a wonderful sunset. 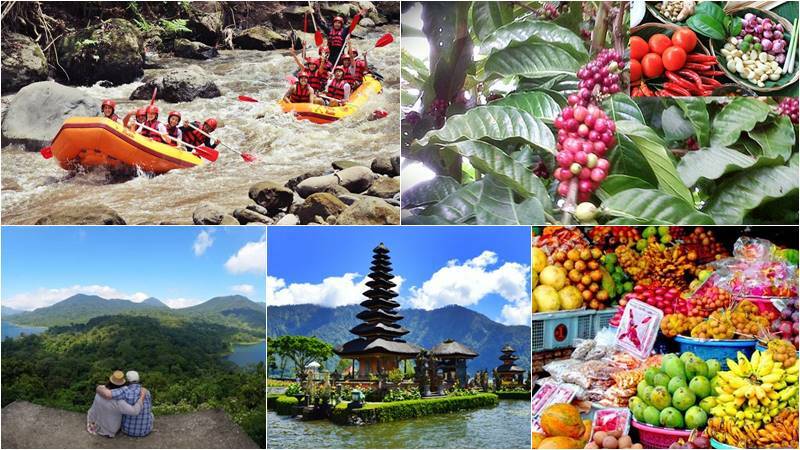 This tour combines exciting adventure of Bali river rafting with the beautiful views of Kintamani with the Batur lake & volcano, spices garden, and also visiting Ubud Art village and beautiful country side. Interesting package deal. 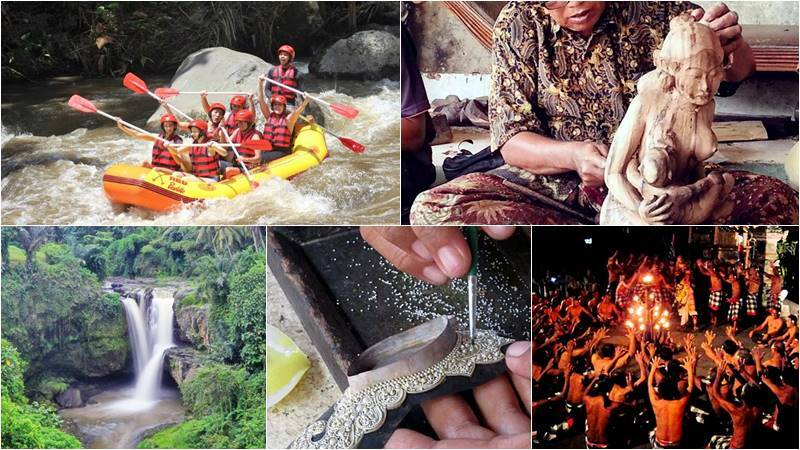 This tour is one of our interesting combination packages that combine Telaga Waja river rafting with other favorite tours: the Besakih Mother Temple, a beautiful view of Kintamani, spices garden, and a beautiful rice terrace of Tegalalang. 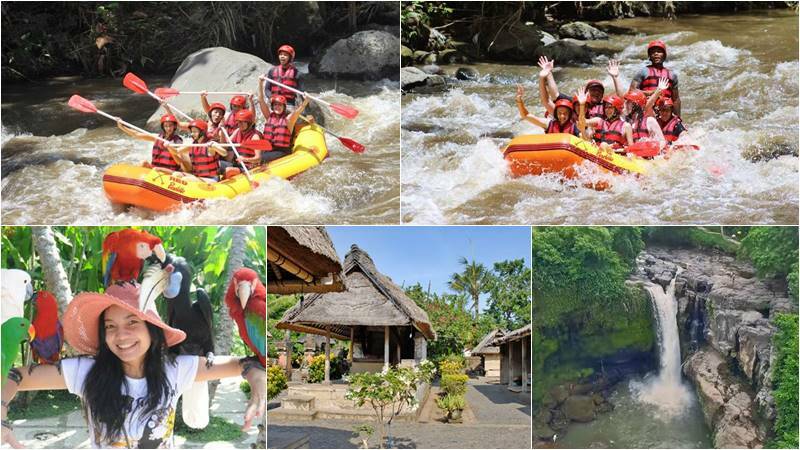 This tour is one of our most interesting combination deals that combine Bali rafting with other tourist activities: visit the Bali Bird Park, where many species of birds can be seen, also visit the Balinese house compound and Tegenungan waterfall. 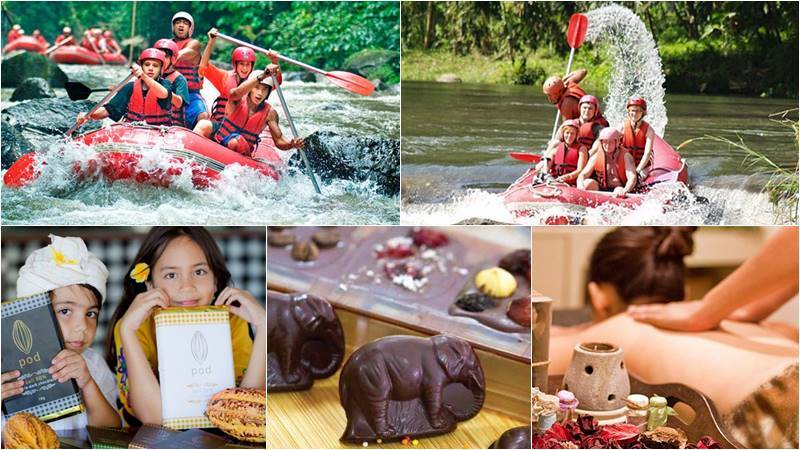 This package is an excellent whole package for one super deal where you will have rafting activity at Ayung River Ubud Bali, then combined with POD chocolate tour and finished with a 2 hour package spa. 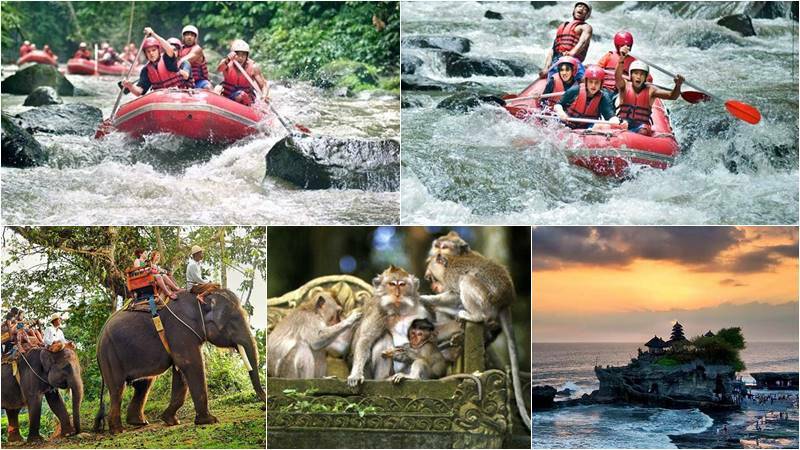 It’s an exciting super deal package where you can enjoy rafting in Bali in conjunction with the 30 minutes elephant trekking at the Bali Elephant Camp and finish your tour of Tanah Lot for the wonderful sunset. 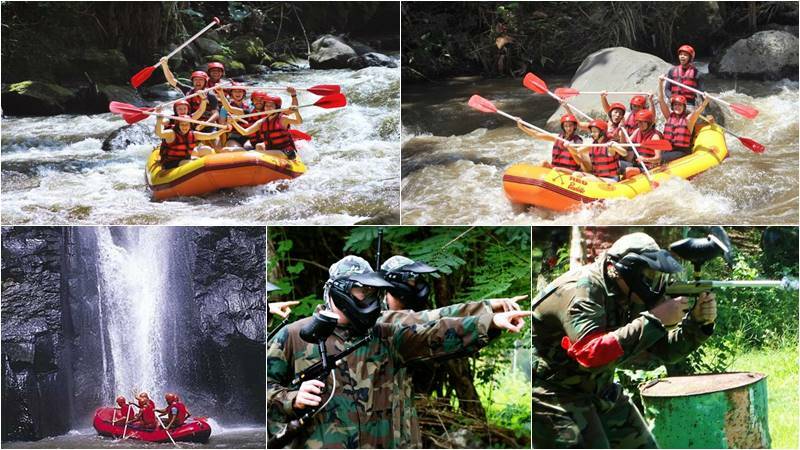 Take part in a Bali rafting tour on the Ayung River or Telaga Waja River and enjoy a great experience, then combine a visit to Bali Safari and the Marine Park and end with 2 hour spa package. 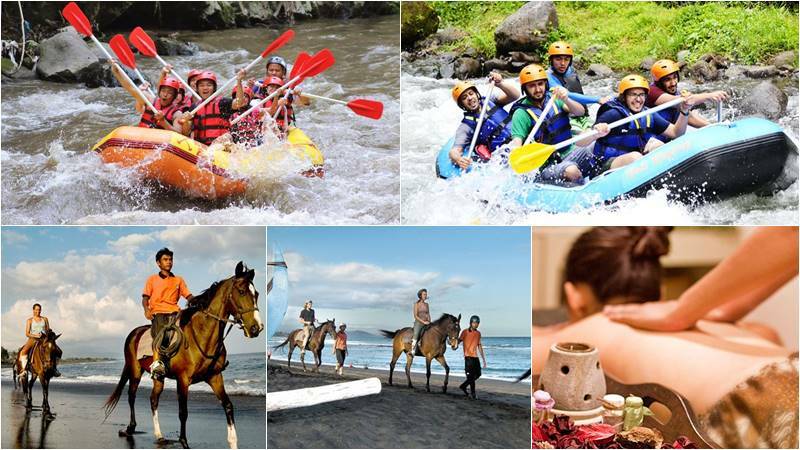 Join the Ayung or Telaga Waja river rafting Bali, with a lot of fun adventure, combine the crashing waves of Saba Beach with horse riding activity at Saba Bay and conclude with a 2-hour spa package. 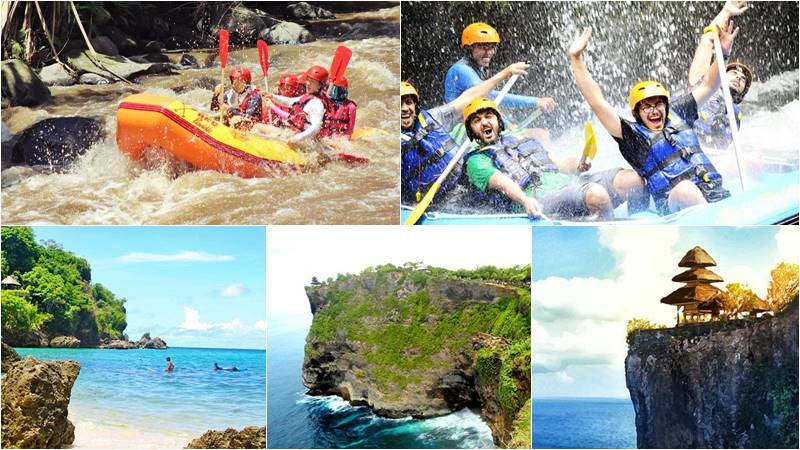 Take part in the Ayung River or Telaga Waja River rafting Bali with a pleasant experience, then combine with a visit to Uluwatu Cliff Temple with amazing Indian Ocean view and BBQ dinner at Jimbaran bay. It’s one of our interesting features in one great deal, where you can enjoy rafting in Bali, then go on tours of Ubud and will be combined with Kecak and the fire dance with Ramayana story. This is one of our most exciting package for you to go snorkeling at Tanjung Benoa beach then go on rafting on the Ayung river for fun adventure and finally watch Kecak and fire dance with Ramayana story. 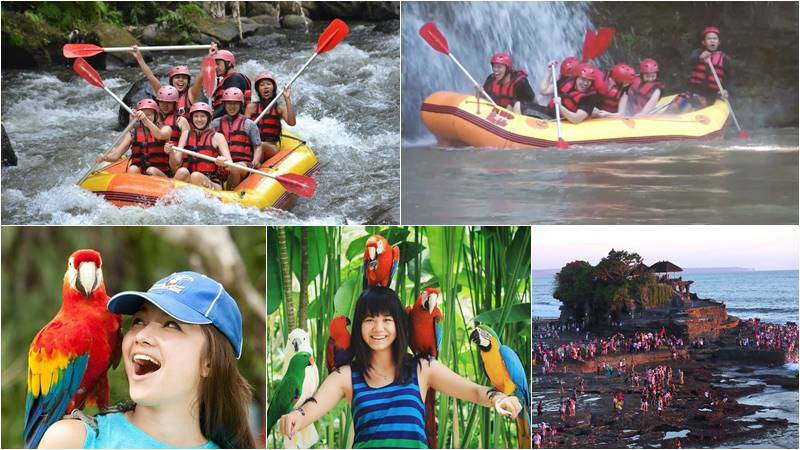 Join us in an attractive package, all of which include Ayung River rafting for a fun adventure and visits to Bali Bird Park with thousand of birds, and Tanah Lot Sea Temple while you enjoy a spectacular sunset. Join us for an excellent Bali rafting package where you will enjoy rafting on the Telaga Waja River and visit the Tirta Gangga Royal Pool in combination with the Water Palace of Taman Ujung Sukasada. Begin with us in one great deal, where you can enjoy rafting on the Ayung River, then combine your tours to the Ulun Dhanu Lake Temple and enjoy a wonderful panorama of the Twin Lake from Gobleg Hill. 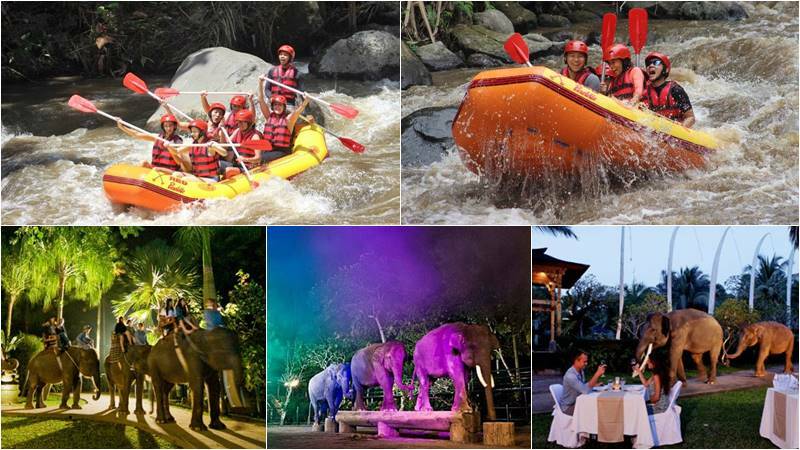 Start your day with us, where you can go afternoon Ayung River rafting, then combine with the most famous night safari in Mason Elephant Park Taro, 35 minutes Safari Under the Star, dinner and Elephant Show included. 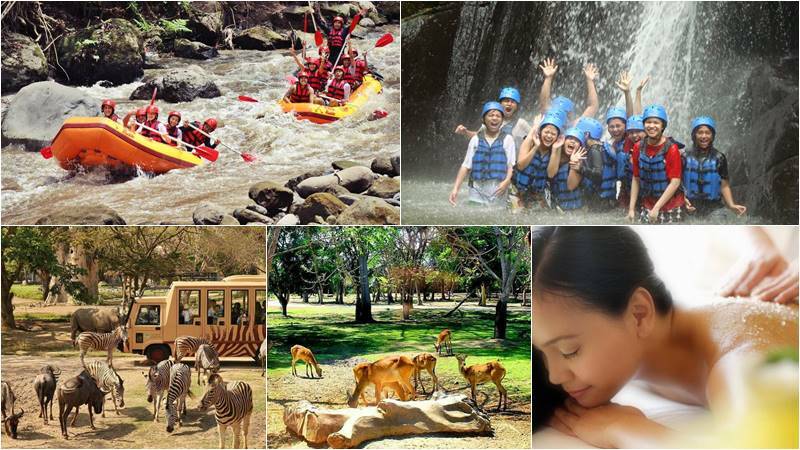 Take a pleasurable rafting experience in the Ayung River or the Telaga Waja River during the afternoon, then join the Night Safari program through a tour of Bali Safari & Marine Park. Barbeque dinner included. 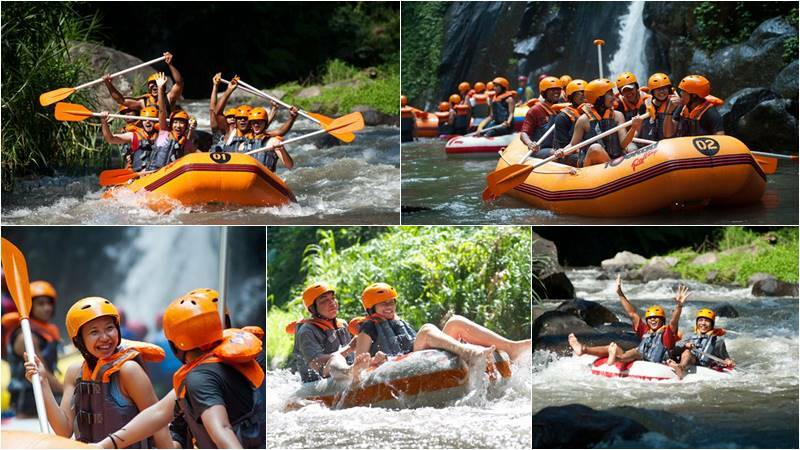 Join us in a in a unique package which includes rafting on Ayung River Ubud for a fun adventure. And paintball games will be played in a cool 1 hectare green, beautiful rural Bali village. Recommended for groups. 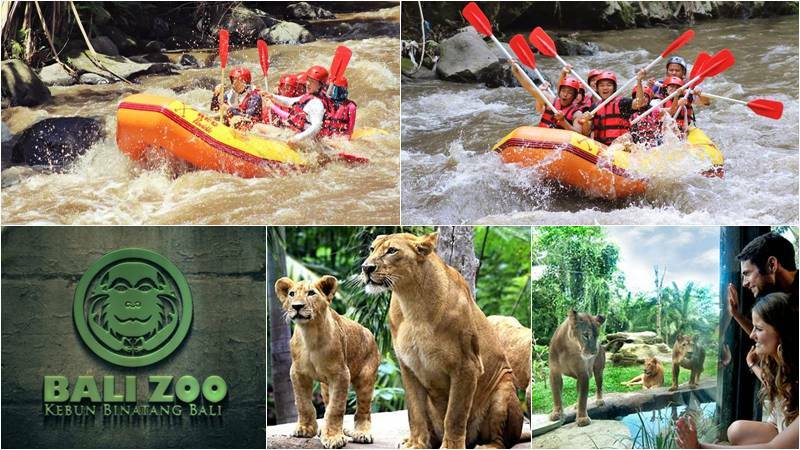 This tour is one of our most fascinating combinations of the Bali Ayung river rafting with other tourist activities: the Bali Zoo, which houses a wide range of 350 exotic animals, mainly indigenous to Indonesia. You will enjoy the Bali camel ride with 1 hour ride in the Nusa Dua area, which is combined with afternoon white water rafting, either at Ayung River, or at Telaga Waja River, fun adventure in just one day. 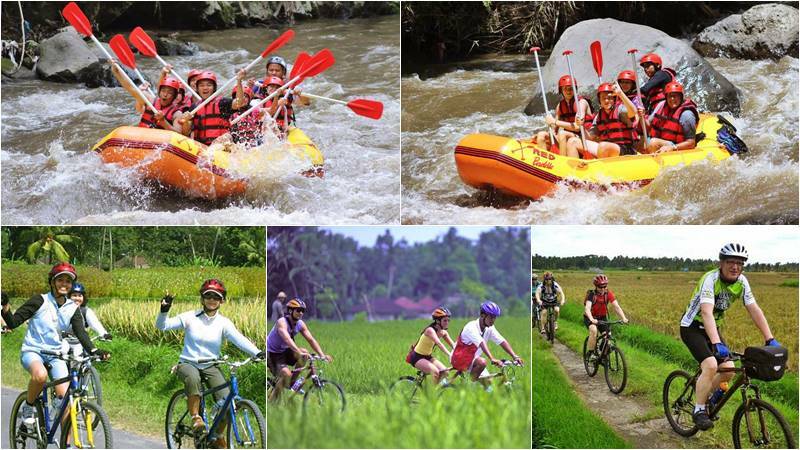 Start your day with us in the morning, where we can take you on a rice paddy, village cycling and continue with afternoon rafting in Ayung River Ubud. This could be the most unforgettable combined adventure. 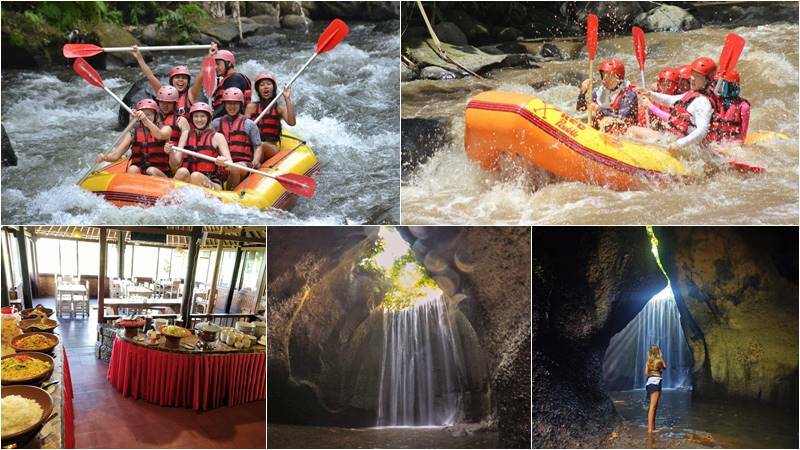 The two adventure activities are combined, Ayung River rafting and Ayung River tubing with a splendid sight over the waterfall, jungle, bamboo tress, and the Balinese artist’s amazing cliff carving. Great package. The tour is one of our most interesting packages combining Bali rafting and other attraction: visit the Bali Butterfly Park to enjoy a unique pleasure of seeing colorful butterflies in an exotic landscape of tropical blossom. Join our adventure package3-in-1. 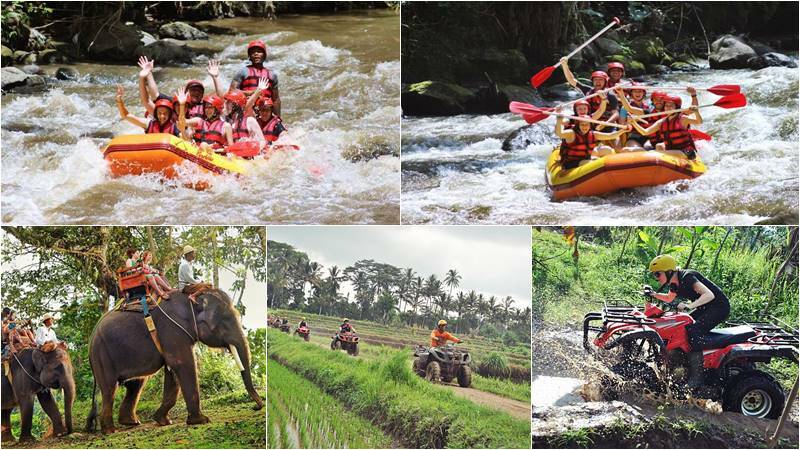 Bali rafting on the Ayung River combines an elephant ride for 30 minutes to enjoy a magnificent view over the river, see the animals like birds and monkeys. This adventure tour ends with an ATV ride in the village of Bongkasa. 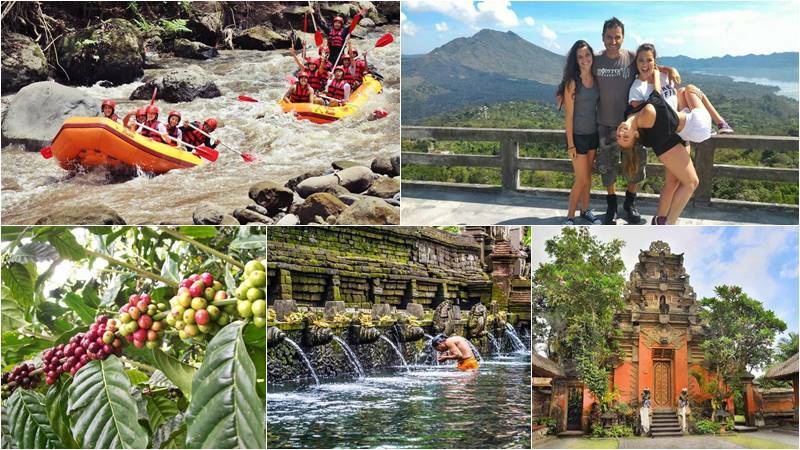 This is one of the most attractive tour package 2019 for you to enjoy rafting adventure on the Ayung River, combined with a tour of Ubud to visit Ubud Royal Palace and and Ubud Art Market. Then the tour will continue to discover Tibumana waterfall at Bangli Regency. 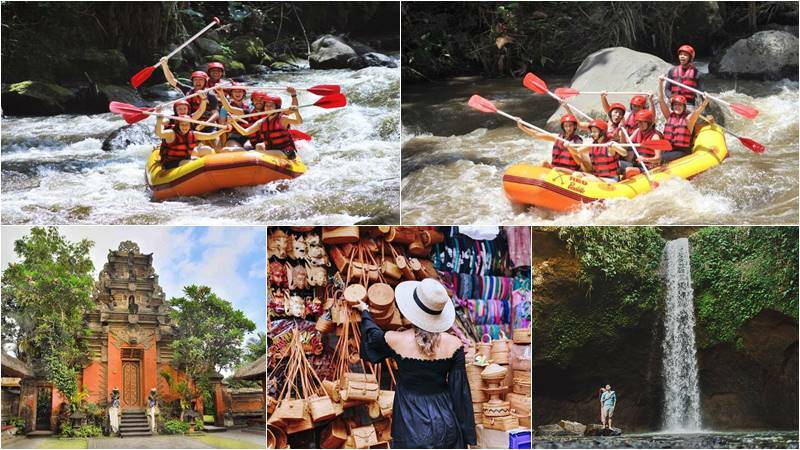 This is a cool Bali tour package 2019 for you to experience Bali Ayung river rafting adventure in Ubud, combined with a tour to Tembuku Bangli to explore Cepung waterfall, beautiful hidden place among the rocks.